These exquisite girandoles are designed in a graceful Rococo style. This style was fashionable in France in the 18th century, during the reign of Louis XV (1715-1774). Derived from the French word ‘rocaille’ (rock or shell), ‘Rococo’ is characterised by its use of classical seashell motifs, curves, counter-curves, and scrolling foliage. It is a highly ornamental style. The girandoles are crafted from silvered metal, parts of which are gilt. Each item features a shaped oval mirror, which is fitted with a pair of three-light candelabra. These candelabra spring from shaped back-plates, decorated with openwork scrolling foliage. The lights' leafy branches curve upwards to terminate in gadrooned and foliate urn-shaped capitals, which hold white candle-tubes. The light created by the candelabra will be reflected in the girandoles’ mirrored backs, illuminating the pair and the room they are placed in. 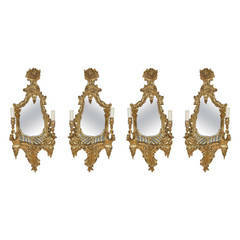 Each with a curved shaped mirror in a giltwood frame with floral cresting, classical columns, acanthus and foliate motifs. Petite pair of two candle mirrored wall sconces from the sumptuous Belle Époque era. Foliate scrolls with full leaf motif bobeche. Priced as a set. A pair of interesting mirrored appliques with armorial coat of arms. Can be rewired. Probably French. Pair of vintage architectural outdoor metal Rococo style wall sconces. Sconces will be newly electrified if needed before delivery.